In the center of the Hive, in the depths of its darkness, there is a bee. She is 1.759218604415e+13, but for short we will call her E13, and as we begin to listen to the hive, she is resting because she has just hatched. Bees are born adults, and she will not sleep again for six weeks. Then she will sleep forever. It is warm in the center of the hive, and she is just becoming used to the pulse and hum when the top of the world is peeled away, and light floods in around her. The alarm scent fills the air but it is masked with the scent of smoke, which grips her instinct driven mind with fear. A million generations of bees before her have honored the fire smell as the harbinger of death, and she rushes to feed in case the colony must take flight and abandon its home. Suddenly the comb upon which she rests is raised from the hive and bright light blinds her. Her wings are not yet hardened, she cannot fly. She can only cling to the comb with all her might, but the comb is shaking. One leg slips loose, and another, and then she is falling away from hive and home. She bounces on something metal and comes to rest in a steadily growing pile of disoriented bees. Legs wave everywhere, wings buzz furiously, and here the smell of anger and alarm is thick, but for E13 it different. It is the smell of fear. As quickly as the terror began it stops as the flood of bees from above slows and then halts. With a swirl and thud and a chorus of unhappy wing beats her prison is carried away and stacked. She cannot see this though, trapped under a pile of angry bees. In this new place the air is quieter, and the beat of wings and tone of the air is that of ten thousand sisters anxious to return home. The attackers are not present, but still the bees are restrained by the screens on the sides. The oldest press against the wire, probing for a way home. E13, however, is too young to know what to do. Then she smells something new. From above her a bee is sending a new signal, one she knows without having ever smelled it before. Gather, it says. It compels her to grasp the bee above her and cling. As the minutes pass others cling to her, and others to them, until the bees have formed a pulsing core in the wooden box that is their prison. The eldest bees continue to crawl the screens searching for salvation. E13 is not so old. Bees are guided and bound to the scent of their queen, but she had so little time to know the queen. Among the smells of alarm and gather, a new scent is drifting, and the moment it strikes E13 it changes her. It is the queen scent. 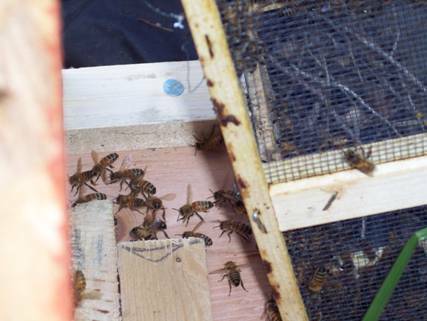 Trapped in a tiny wooden cage, separate from her sisters is a queen bee. She is not the queen from E13’s hive, but E13 is lost without the scent of her queen. Any queen. E13 works her way forward into the ball of bees until she can touch the screen separating her from this different queen. She extends her proboscis through the mesh, touching the new queen, picking up from her a jolt of this scent, and in a flash it is done. This queen is now the queen. Her queen. Others do not agree. They grasp the screen, biting at it, scratching it with their mandibles, flexing their stingers. This is not the queen, they say. If you put voice to the warring chemicals, it would be an argument, a vicious war of words and deeds. “There is a queen. I am the queen.” The bees do not agree at first, but the longer they listen to her, the less they can remember which was the voice of their queen. Some approach and feed her, sharing nectar they stashed before the shaking. As these bees feed others the scent of the queen passes along, whispered mouth to mouth, “There is a queen. This is her scent.” It will be days before the process is complete, but in the center of a box, at the heart of a bundle of bees, E13 has borne witness to the birth of a new colony. Bees are colony organisms, meaning that the living being is really the sum total of the hive occupants, much like a living city. New colonies can be formed by taking pieces from existing ones, but the process is not gentle. In this case, it's like picking up a bus load of people, shaking them until their organs fall out, and then bundling the resultant mess in with a nice fresh heart and waiting for a person to emerge. 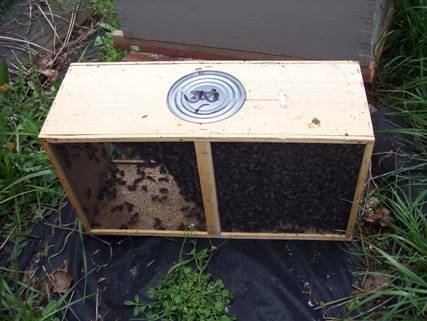 Packages (the term for the aforementioned buzzing box o' bees) are literally shaken together, by putting a metal funnel above a package box, grabbing a frame from a hive, and shaking the bees off of it, and down the funnel. They sound like M&M's as they go down. The secret to making this work is that before the bees were shaken in, a queen was placed carefully in a queen cage, hanging inside the package box. Once the box weighs the right amount (usually 3 pounds), the funnel is removed, a feeder can is put in, and the package is carried off to stack somewhere in a back room or dock. During the shaking, alarm pheromones flood the air, a scent like rotten bananas which incites bees to sting and whips them into a frenzy, but for little good. Alarm! Alarm, screams the voice of the hives, amid the confusion of the shake. In the tiny box instinctual terror reigns as they are bounced about, the alarm scent mixing with the scent of crushed bees. Bees are driven to defend their home, and return to their queen. Each and every queen smells different, and the bees of a hive know their queen, because it is like knowing themselves. She may be their mother, or not, but the reigning queen is imprinted upon their chemical memory like the North Star. The Queen, The Hive, demands instinct, and they shuffle from edge to edge on the screen, pressed in among thousands of others, but they cannot reach their hive, and in this quiet dock where the packages are stocked, the scent of home is far away. 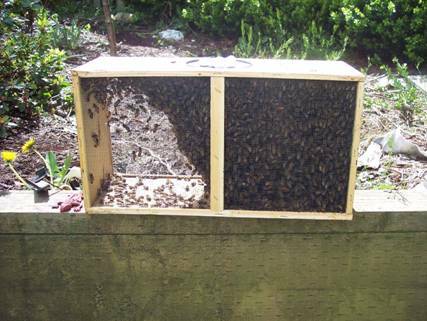 The field bees that were caught in the shake are older, more stubborn, their "memories" go back further, and they continue to press against the screen of the package, but in the center, something is changing. The younger bees, nurse bees and house bees are more impressionable. Their short lives have been spent in the heart of the broodnest, where the scent, the voice of the queen is everywhere, so strong that it is like she is thundering, I am the Queen. The Queen is here. All is well. In this package, that familiar chemical voice has fallen silent. In its absence, they are lost. Then, the bees nearest the queen, the youngest bees, catch a new scent, mixed with the terror and alarm. 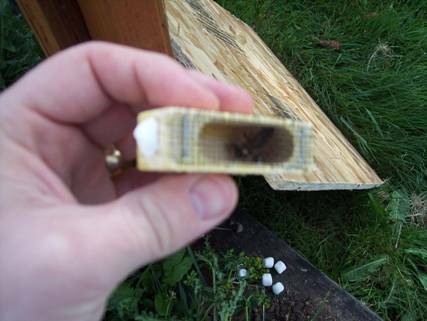 It is the pheromone of the new queen in the package, and while it stands out as not quite right, they are calmed. A single bee lifts its abdomen and begins to beat its wings, releasing a new scent, that smells of lemon grass. This is the gathering scent, a whisper at first that says We are here. Gather. Other bees catch the scent, and pass it on, and now the whisper is spoken aloud, Gather, and louder yet, GATHER as the cluster forms about the new queen. In this area where the packages are stocked, the scent is everywhere, and the bees, each in their own private disaster, gather together. The mind of the colony, formed by consensus and communicated by chemicals coalesces. It is not yet unified, but it is present. The colony is estranged from itself, split from those who remember the "voice" of the old queen, and those too young to know differently. Even among the nurse bees, they are divided, at times driven to tend to this queen among them, at times driven to tear her apart, but as the hours go by, another shift occures. Their chemical memories are not forever, and in the confines of the package, as instinct demands Find your Queen, the only answer is the ever present repletion by existence of the new queen: I am the queen. All will be well. If there are no other voices to challenge hers, it will be. Their North Star has been eclipsed for so long they can no longer remember what it looked like, but in their communal darkness, they see a new light. The oldest of the field bees, the foragers, may never agree. They may never fully join the new colony, drifting to some other hive, or dying in the cold, but when the colony speaks now, the voice is clear and united. United though they are, tough times await this new package. When they arrive at their new home they will be sprayed with sugar water (sometimes submerged! ), and then unceremoniously dumped into their new home. In the darkness of the new hive, this saga will play out again, but at a lighting pace, the colony quickly sorting itself, verifying that the queen is present, and then gathering. For a day they hang, organizing. And then the colony begins its life. Foragers forage. House bees clean. Nurse bees draw comb. And the queen? She is present, walking among her workforce. As she passes, the bees that attend her pass her scent, one to another, until it fills the colony, giving purpose to them, driving the colony to exist, the hive mind to decide. The Queen is here. All is well, says the scent. In time, that is true. So, now that you have a bee’s eye view of the process, let’s move on to actually getting the bees into their box. This probably won’t hurt a bit. Bee Prepared: I know, you can’t wait to get to the part where there are bees flying everywhere, crawling all over you, and the air is filled with buzzing, but we aren’t quite ready yet. Before you start, make sure you have the following supplies ready to go. A hive of some sort. Langstroth, Top Bar, a custom design, whatever. It should already be assembled and in place wherever it goes. If you are going to paint it, it should already be painted and dry. A box of bees (package). 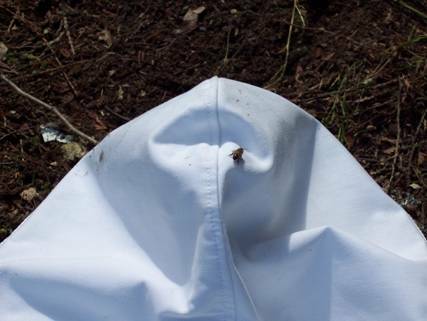 A veil, bee suit with veil, or veil with jacket. Keeping the bees out of your ears and eyes is a good idea. Also, if you don’t have a bee suit, do not forget to tape down/Velcro closed your pant legs. There’s going to be a lot of confused bees soon, and confused bees crawl. Your dark pant leg will look quite inviting, and the results will be humorous to you. In a few years. Assuming you are not allergic. Gloves? That’s up to you. If it makes you calmer, go for it. Don’t have a pair? Use a pair of rubber dish gloves. Yes, the bees can still sting you through it. It’s more about how you feel than whether or not it’s really useful. 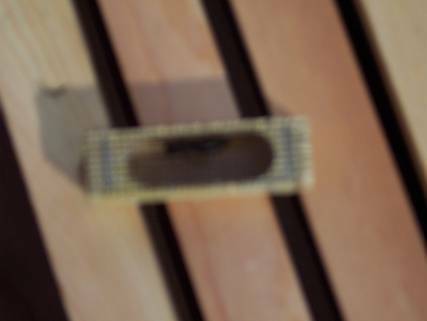 A hive tool, or screwdriver with narrow edge. A spray bottle with sugar water in it. You want it more on the spray end of the spectrum than the pressure washer side of things. 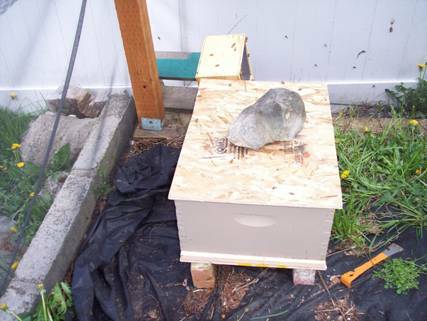 A large rock or brick for the hive top. What is missing from this list? A smoker. Except it’s not missing, it’s just not needed. While you might be eager to light it up old smoky and do your impression of a dragon, leave the smoker in the shed. Smoke calms bees by making them drink honey and masking the alarm pheromone. If you haven’t noticed, take a good, long look at the package. See any honey in there? No? Well, another thing smoke does is make them go down in the frames. Take another look at that package. See any frames there? No? Well, another thing smoke does is upset the bees, when they can’t gorge on honey, and they have no place to hide. With no frames, and no honey, the only thing that smoke will do is add to their paranoia level. You’ll get plenty of chances to use the smoker through the months ahead, I promise. Here they are, in all their packaged glory. You want them out. They want them out. First, you need to get ready. Those bees have probably been in the package for a few days. The feeding can (which you cannot see in this picture), is behind the wooden strip in the center, covered in hungry bees. That’s the first thing to address. Those bees are probably hungry. If you don’t feed me for a few days, I get pretty grouchy. The bees aren’t too much different. Mix up some sugar and water, put it in a clean spray bottle, and spray the screen. Older books (and some older beekeepers) recommend brushing the syrup onto the screen. To see why I think that’s a bad idea, tilt the package over slightly, and look down at the screen. See all those feet and tongues sticking through? Don’t brush those off. Spray them. When you spray the screen, the sugar water beads on it and you don’t see tongues extending out to take it, they’ve had enough. Full bees are happy bees. Take a moment and smell the package, because you won’t get another chance to do this for a while. No, this isn’t one of those weird shows where you are going to gag. If the bees are fanning (and they probably are), they will smell slightly of lemon grass. It’s a good smell, the gather smell. Remember it. If you need to store the package until you can hive them, do so some place dark and quiet but not hot. If you are wondering whether or not they like it better in the dark, listen to them in the dark. Now, flip on the light and listen again. See? Now that you’ve given them several good drinks of syrup and they are back in the dark, they’ll be ok if you can’t hive them today/tonight. Just remember, if you took a road trip in a Volkswagen bus with several thousand friends, you would probably want to stretch your legs on arrival. Don’t make them wait too long, ok? Get ready to open the box. Not that box, the other box. Do all this right by the hive. 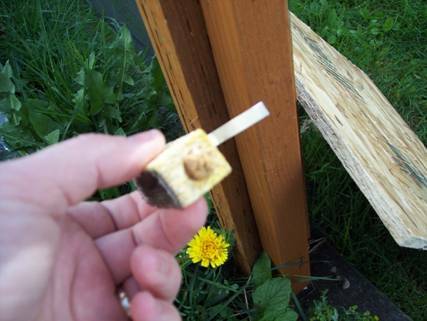 Do not disassemble the package across the yard from the hive, then attempt to ferry the pieces back and forth. You’ll leave a trail of confused bees behind, and spend the afternoon chasing them around to try and put them back in the hive. Take a moment to put everything close to the hive. 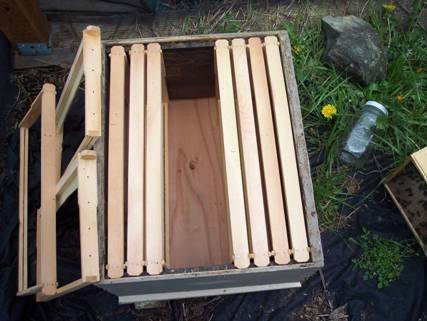 You’ll be glad you did, and speaking of hives, here’s one with the top cover removed. As nice and orderly as the hive above is, it’s time to take it apart. 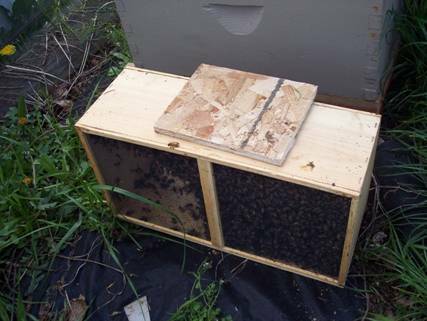 You are going to need room to put some bees into this box, along with a queen (safely enclosed in her cage). Remove three of the frames, and stack them to the side. I’m using foundation starter strips, but if your frames are plastic, black, have full sheets of foundation, or just plain don’t look like mine, don’t panic. The bees don’t mind. If you read somewhere else that you should remove four frames, or five, again, this is not a problem. Remove three, then look at the space. If you feel like you need more room, take out another one. Equipment check time – At this point take a moment to make sure your equipment is ready to go. Do you have a veil? Are your pant legs tied, taped, or strapped closed? If your package doesn’t have the can showing on one side, it has a thin slat of wood stapled to it covering the can. Pry it off with the hive tool, and now your package looks like mine. Remember that the package is an artificial swarm. The scent of the queen, or queen pheromone, is what is inspiring them to gather together around her. Normally that’s a good thing. Right now we need them out of the box, and currently there are a few thousand of her lady friends in the way. 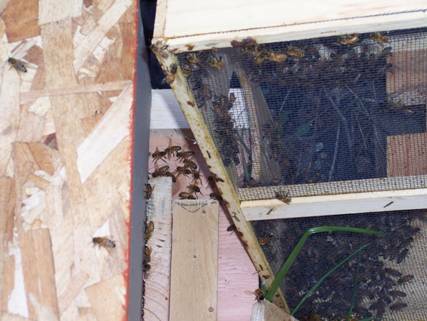 Our goal is to remove the queen cage so it can be hung in the hive. The queen cage has a thin strip of metal attached to it that fits through the slot by the can. That thin piece of wire will bend and slide along the slot toward the opening where the can is until you can lift out the queen. Bee Careful: Do not bend the wire yet. If you do not hold onto it, the queen cage can slip down into the package, and you will get the joy of reaching into the ball of bees to retrieve her. Besides, the can is still in the way. Start with a few more squirts of sugar water on the cluster. These are bees, not fish, but if they are slightly wet, they’ll fly less. When you remove the can, the hole it is filling will be open. When the hole is open, some bees will fly out. Do not panic. Even if they fly near you, do not panic. Even if they land on you, do not panic. We now return to the regularly scheduled package installation. The bad news is: You have a mass of wet, sticky, homeless bees. The good news is: Things can only get better. Take a close look at that can again. Pointy Sharp things can be fun. Most likely, the can is stuck. 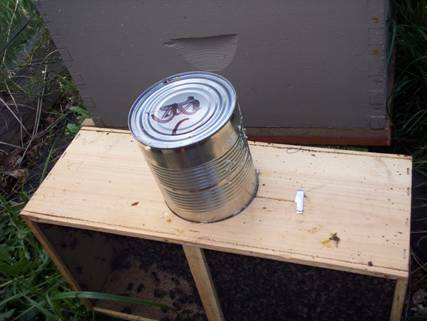 Take your hive tool, and look at the edge of the can. You can pry at the edge of the can to lift it up. Work away at the edge of the wood until you feel the hive tool to catch on the can rim. 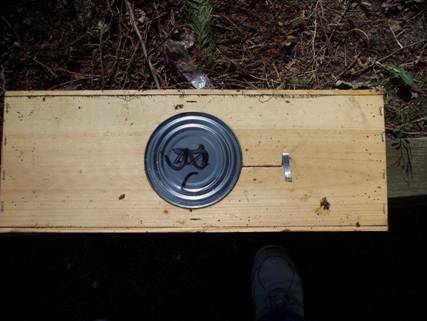 If the can rim is down too far, use the hive tool as a miniature pick to dig into the wood and notch it enough to grab that rim. Now you can lift it ever so slightly. Lay the package on the side if you need to, but be gentle. Work the hive tool around so that the flat of the blade is under the can rim, and you can get leverage to start that can out. Now, grab the can and slowly, softly, edge it further out. The point here is not to remove the can entirely yet, but if that happens, don’t panic. Do not pull hard on the can, unless you are prepared for the can to shoot out. Worse yet, if that happens, you might drop the package. So don’t, ok? If you look closely, you can see why the can was hard to remove. There are tiny bits of wax drawn on the edge. The moment has finally come to kick that can. 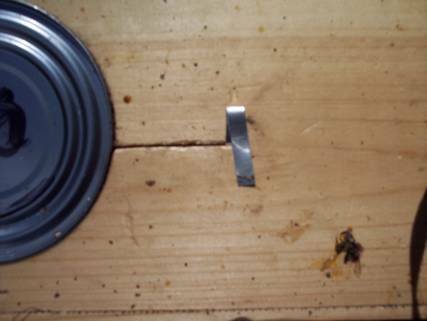 Bee Aware: When you do this, the hole will be open. Some bees will come out. Do not panic. Have that paperback/small piece of plywood handy. 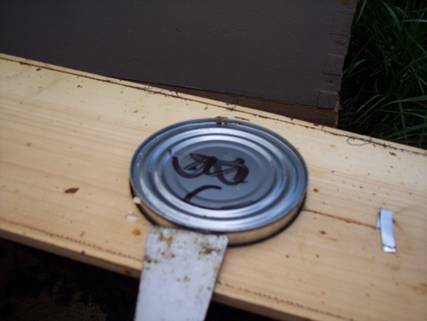 If you are at ease with bees flying around you can skip the part about covering the hole, but if you are slightly nervous, keep that board handy. Keep in mind, however, that the goal here is not to keep the bees all in the box. If a few get out, or even more than a few, that is no cause for concern. Since you have some work to do with the queen cage next it might be easier on you if there are a few fewer flying friends. 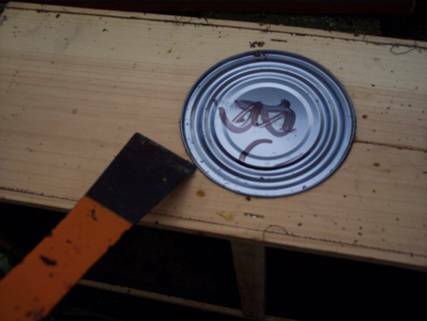 Take the can out and slide the paperback or wood over the hole gently. Remember that piece of metal that holds the queen cage? It’s time to use that. Pick up the box with one hand on each end if the hole isn’t covered, or one hand over the piece of wood and one on the end if it is. 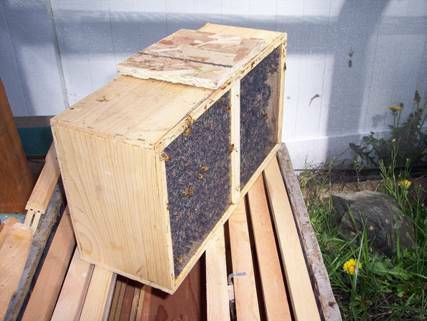 When you pick it up, watch to make sure you do not grab any bees that might be clinging to the outside of the box or screen. Firmly whack the box on the ground. Your goal is not to squish bees, or smash the box, or anything like that. 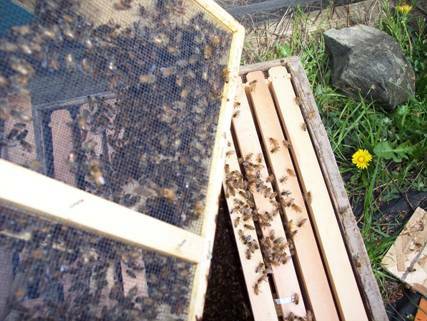 The bees are clustered about the queen cage, and you want to knock most of them off. They will buzz. They will sound unhappy. If someone smacked you upside the head, you’d be slightly unhappy as well. Take the metal strip, bend it up so that it can slide along the slot, and slide it toward whatever you are using to cover the hole. Sometimes the person who cut the slot for the queen cage was having a bad day, and you’ll get to turn the tab or angle it to continue sliding out. Think of it like a carnival game. If you didn’t block the hole, just slide it on out. If you did, uncover it, and lift out the cage. A bunch of bees will come with the queen cage. Recover the hole, if you are going to, and turn your attention to the queen. I like to set the queen cage on top of the package and get ready for the next step. Take a moment to observe any bees on the screen. Are they extending their tongues to feed her? Or jerking back and forth, biting at the cage? That will tell you if the queen is accepted by the package yet. Usually, the bees on the cage will leave on their own, letting you work in peace. If not, just don’t squash one and you’ll be fine. Step 5: Your throne awaits, Your Majesty…. Now we have to get the queen cage ready and into position. You can see the queen in the cage, and it’s a good idea to take a look at her. If she’s dead, better to find out right now. If she is dead, you need another queen, so put the can back in the package, put the package some place safe, get back in the car and go get one. You need a way to hang the queen cage in the hive. See the metal tongue by which you lifted the cage from the package? Bend it to make an L shaped hook wide enough to hang from a frame. Next, look at your cage. 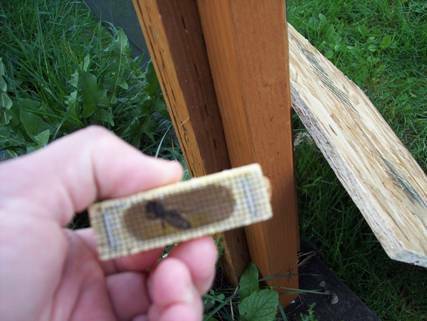 Some queen cages come with candy at one end which the bees chew through, releasing the queen. The time it takes them to chew through gives them time to accept the queen. This candy is usually covered with a cork to keep the queen in until the package is hived. Some cages, however, do not have candy they have only a cork. No cork means no slow release. If you package has been together for days that’s not a big deal. In that case this queen is the only one they’ve got, and they’ll accept her (unless there’s an unmarked queen loose in the package, which happens from time to time). Some people advocate directly releasing the queen. I don’t, because I paid a lot of money for her and patience is a good idea at this point. If your cage has candy it probably has a cork covering the candy. If so pull that out. If you pulled the wrong end and there’s a set of eyes staring at you, don’t worry, proceed ahead as though you never had a candy plug. For those in the “Just a cork” club, we’ll make a plug to slow them down. Get one of the marshmallows you brought with you. Wait for the queen to go to the other end of the cage (and she will, if you are patient). Remove the cork and stuff a marshmallow into the cage. Hang the queen cage by the “L” from a frame – if there are no attendants, the candy should go down. If there are attendants, try to get the cage at an angle so that a dead attendant does not block in the queen. 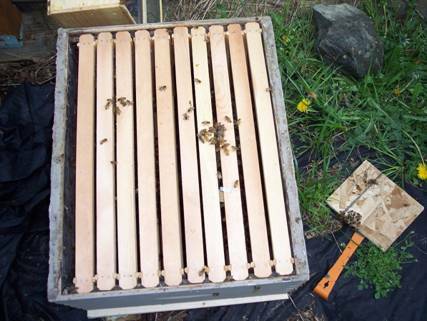 Bee Careful: If you are using foundation, and your cage, like this one, has only one screened side, make certain that that side is available to the workers. Otherwise, your queen could starve. She’s quite co-dependent on the workers. I like to adjust the cage until it hangs so that I can put the frames back together, but just about any way you put it in will work as long as the bees can get to their queen to feed her, and the candy to eat it. The queen cage is hung in the hive. The frames are removed. The can has been kicked. The only thing left to do is to boot a few thousand bees into their new home. Before you do that, look at the edge of the screen. See all the bees on the outside? Those are the confused bees that came out when I opened the package. If they were angry, they’d be on me, bumping me, and probably stinging. In a moment, you will be dumping several thousand of them into their new home, so there will be a great many more confused bees. Stay calm. Bees are aggressive when they’ve got something to fight for. These bees have nothing. They are miserable, cold, wet, sticky, and have been bounced around, but at this point all they’d really like is a nice home and some peace and quiet. That one picture represents a lot of shaking. The package is now mostly empty. Tilt the box up against the entrance to let the stubborn, stupid, or straggler bees have a chance to get with the program. That’s nice, isn’t it? They can walk right out of the package and into the hive. Take the frames you set to the side earlier and put them gently into place. If you move slowly the bees will get out of the way. Some bees are dumb and get killed. Cry for them later, because you’ve got more to do right now. With all the frames in, slide your cover into place. If you have an inner cover put it on first, using it as a bee dozer. 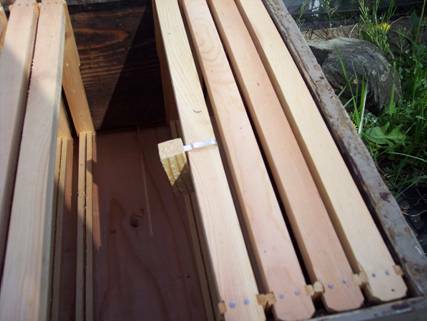 The cover will slowly pushing the bees out of the way (usually off the front of the hive). If you are using a migratory cover (I am) just do it with the cover. Put a rock on the lid. Gather up your tools and take a quick peek at the front of the hive. Odds are you have bees in front fanning. Their tails are in the air, their wings are spread and beating, and their abdomens pulse. If you lean over and sniff, you may catch a trace of the gather scent. This is excellent, as they are releasing a chemical scent that will motivate the stragglers to join the party. Go back to the house and have a helper look for bees on your back, legs, etc. Be careful if you are pulling off your hood/veil – this is the top of my jacket hood after the hiving, right where I normally grab it to pull it off. There were about five more. While those bees aren’t angry, if you squish one it is likely you will regret it. While you are at it, if you taped down your pant legs carefully check to see if a misguided bee has attempted to burrow into your cuff. I carried three of them back to the house with me, and one stung me on the stomach while I talked with my wife. How’s that for gratitude? Congratulations – you have hived a package. Leave it alone for a week to get things rolling, then come back ready to learn. A week is a killer, isn’t it? 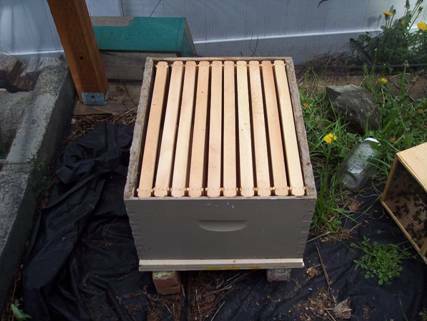 If you want to know how things are going watch the front of the hive – when you see pollen coming in, it’s a good sign. Bees bring in pollen to feed brood, and you want lots and lots of brood (but that’s for next time).